Anti-N-methyl-D-aspartate receptor encephalitis is a recently identified autoimmune disorder with a prominent neuropsychiatric presentation. We present the case of a 15-yearold girl with partial complex seizures with secondary generalization and acute mania with psychotic features. A positive diagnosis of anti-NMDA-receptor encephalitis suggested the specific treatment. Despite first-line immune treatment, the patient progressed to stupor, malignant catatonia, and autonomic instability with the risk of cardiopulmonary function failure. She improved after second-line immunosuppressive therapy (cyclophosphamide and rituximab simultaneously). Post-cognitive sequelae (memory impairment and deliberation) disappeared within 8 months of follow-up treatment and intensive cognitive rehabilitation. This case report emphasizes the importance of differential diagnosis and adequate treatment of catatonic syndrome, especially in young adults. Early recognition and adequate treatment is essential for a good outcome for the patients. Anti-N-methyl-D-aspartate (NMDA) receptor encephalitis is an autoimmune encephalitic syndrome with a specific pattern of presentation, course, and outcome. After the initial reports by Dalmau et al. , multiple centers around the world reported similar cases. In 2008, Dalmau et al. published a series of 100 cases of anti-NMDA-receptor encephalitis. Initially conceptualized as a paraneoplastic syndrome, it was later defined as autoimmune encephalitis with varied immunological etiologies. We differentiate paraneoplastic (associated with tumors) and non-paraneoplastic forms (without tumor association). The syndrome predominantly presents in young women, with 60% of them having a neoplasm (usually ovarian teratoma). The detection of the ovarian teratoma is age-dependent: approximately 50% of female patients older than 18 years have uni- or bilateral ovarian teratomas and fewer than 9% of girls younger than 14 years have a teratoma. Cases with associated tumors other than ovarian teratoma include testicular germ cell tumors, teratoma of the mediastinum, small cell lung cancer, Hodgkin’s lymphoma, and neuroblastoma. In non-paraneoplastic (autoimmune) anti-NMDA-receptor encephalitis, previous infections such as mycoplasmaand varicella zosterare suspected to play a role . NMDA receptors are ligand-gated channels that play important roles in synaptic plasticity. Their functions are critical for judgment, perception of reality, human interaction, the formation and retrieval of memory, and the control of unconscious activities, such as breathing and swallowing, also known as autonomic functions. NMDA receptors are heteromers of NR1 and NR2 subunits (A,B,C, or D) that bind glycine and glutamate, respectively. Both glycine and glutamate must bind for the NMDA receptor to be functional . NMDA receptors maintain synaptic plasticity; their disruption causes seizures, memory deficit, and behavioral problems. IgG autoantibodies against the NR1 subunit of the NMDA receptor are considered to be definitive in making the anti-NMDAreceptor encephalitis diagnosis. Intrathecally produced IgG autoantibodies against the NR1 subunit of the NMDA receptor cap and internalize them . The clinical course is characterized by five stages: prodromal stage, neuro-behavioral stage, nonresponsive stage, hyperactive stage, and gradual recovery stage. Many patients present with prodromal headache, fever, and viral-like symptoms, followed in a few days by a progression of symptoms that include  psychiatric symptoms (agitation, bizarre behavior, hallucinations, and delusions), insomnia, short-term memory loss, concentration difficulties, seizures, dyskinesias (orofacial, choreoathetoid movements, dystonia, rigidity, and opisthotonic postures), decreased levels of consciousness, stupor with catatonic features, autonomic instability (tachycardia, bradycardia, fluctuations of blood pressure, hyperthermia, and sometimes hypoventilation requiring mechanic ventilation), and language dysfunction (mutism and echolalia). The latter include symptoms of frontal lobe dysfunction (executive dysfunction, behavior disinhibition, and memory deficits). Children may present with speech regression and irritability instead of catatonia or psychosis. • Detection of antibodies to the NR1 subunit of NMDA receptor in serum and/or CSF (definitive confirmation of the diagnosis). After treatment or in the advanced stages of the disease, the CSF antibodies usually remain elevated, while serum antibodies may be decreased by treatments. The titer of CSF antibodies appears to correlate more closely with clinical outcome . The differential diagnosis includes primary psychiatric disorders (psychosis or schizophrenia), malignant catatonia, neuroleptic malignant syndrome, and viral encephalitis. Resection of the tumor (in paraneoplastic form), glucocorticoids (methylprednisolone, 1 gram daily for five days), intravenous immune globulin (0.4 g/kg daily for five days), and plasma exchange often result in improvement. If there is no significant improvement after 10 days, second line therapy is initiated with rituximab (375 mg/m2 weekly for four weeks) combined with cyclophosphamide (750 mg/m2 given with the first dose of rituximab, flowed by monthly cycles). Children are generally treated with just one of these agents, usually rituximab. Treatment is continued until significant recovery occurs. Relapse of anti-NMDA-receptor encephalitis occurs in 15 to 24% of the patients, sometimes after several years. We generally continue immunosuppressive therapy (usually azathioprine) for at least one year after initial immunotherapies are discontinued . According to the original case series by Dalmau, approximately 75% of patients with anti- NMDA-receptor encephalitis recover or have mild sequelae; the other 25% have severe deficits or die. Subsequent studies have identified a 12to 24% risk of relapse. Mortality of 7% of patients at 24 months has been noted [2,7]. We present a 15-year-old girl with no medical, psychiatric, or surgical history, referred to the hospital after two partial complex seizures with secondary generalization. She was treated with valproic acid with good effect and she became seizure free after titration of valproate. However, two weeks after the seizures, progressive psychiatric symptomatology developed. Her parents reported that she had sudden changes of mood and behavior, becoming more irritable and sensitive. Over the course of a few days, she got worse. She presented manic symptoms with psychomotor excitement, logorrhoea, and insomnia. She was unable to recognize her parents and friends, and she became paranoid. An acute examination was conducted in our department, including hematological, biochemical, and endocrinological screening (T3,T4, TSH, cortisol, ACTH) all with normal findings; magnetic resonance imaging (MRI) and MR angiography and venography of the brain, with normal findings; and electroencephalogram (EEG), with regional slowing in the right temporal area (phase reversal between electrodes T6-T8 (Figure 1). 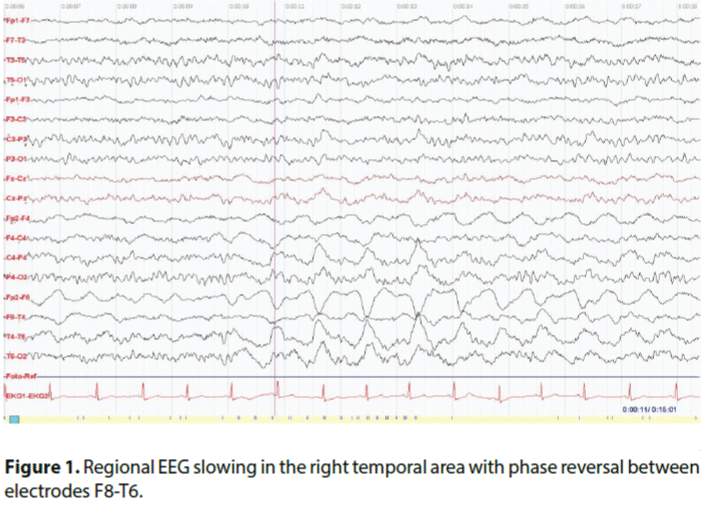 Figure 1: Regional EEG slowing in the right temporal area with phase reversal between electrodes F8-T6. Consequently, a lumbar puncture was performed, with a finding of serous inflammation in the CSF (mononuclear cells 47, polymorphonuclear cells 0, proteinorrachia 360 mg/l, glycorrhachia 3.2 mmol/l, lactate 1.4 mmol/l, positive intrathecal synthesis- 4 oligoclonal bands, serology of neuroborreliosis and neurovirus negative). Cerebral positron emission tomography (18FDG-PET) was negative. Differential diagnosis concluded an autoimmune disorder of the central nervous system; for this reason, a complete immunological profile was provided (CIK, C3, C4, ANA, ENA, ANCA, ds- DNA, anti-SS, cardiolipin, RF, anti-TPO, anti-GAD; antibodies against membrane and synaptic antigens were evaluated by indirect imunoflorescency: anti-NMDAR, anti- AMPAR1, anti-AMPAR2, anti-GABABR, anti-LGI1, anti-caspr-2). We found positive anti-NMDA-receptor antibodies in the serum and CSF. We next differentially diagnosed paraneoplastic and non-paraneoplastic forms of anti-NMDA-receptor encephalitis. A complete oncological screening was provided (X-ray of the cardiopulmonary area negative, CT of abdominal and pelvic area negative; gynecological examination negative; wholebody PET negative; skeletal scintigraphy negative; hematooncological screening negative; antibodies against onconeural antigens by western blot method: anti-HU, anti-YO, anti- RI, anti-Ma2/Ta, anti-CV2/CRMP5, and antiamphiphysin negative). The positive diagnosis of anti-NMDA-receptor encephalitis suggested specific treatment. We started treatment with the first-line immune therapy including high doses of corticosteroids (intravenous methylprednisolone 1 g per day; 30 mg/kg/day 4 times). This had no effect, so we continued with plasma exchange (5 cycles in 10 days) and IVIG (2g/2 days), with a further progression of clinical presentation. The patient had to be transferred to an intensive care unit, where she progressed to stupor, malignant catatonia, autonomic instability (episodes of hypoventilation and hyperventilation, paroxysmal tachycardia, incontinence, mydriasis, hyperhydrosis), paratonia, emotional disturbance, positive deliberation phenomenons, symbolic dysfunction, aphasia, hyperreflexia, mild muscle rigidity, and tremor. Because of gastrointestinal dysfunction she declined enteral nutrition and parenteral nutrition must be initiated. Despite of parenteral nutrition she lost 5 kilograms of weight and generalized muscle atrophy developed. We started with second-line treatment included cyclophosphamide 750 mg/ m2 monthly (3 times in all) and rituximab 375 mg/m2 weekly (3 times in all). The course of treatment was complicated by febrile neutropenia and insomnia. After the treatment was initialized with combined immunosuppressive therapy (cyclophosphamide and rituximab simultaneously), the status of the patient was stabilized. The first mild improvement was noted after two weeks. She attempted simple motor reactions, she became able to sit with support, and parenteral nutrition was switched to enteral nutrition by PEG (because she refused food intake). After three weeks, the patient was able to sit unassisted, and we noted the first emotional reactions (crying and laughing) and first simple verbal contact. Intensive complex treatment was provided (rehabilitation, logopedics, psychotherapy, broad stimulation with music, television, art therapy, parents and friends, etc.). After one month she was able to stand with support and take her first steps, to communicate with simple words, to sing children’s songs with her mother, and to perform goal-directed movements. After six weeks, she was able to stand up and to take a few steps alone, her facial and emotional reactions improved, and her communication became better (simple sentences). At the beginning of the improvement she was very quickly defatigable, with requests to sleep after one hour of activity; lucid intervals were prolongedin a stepwise manner. After two months, she was able to walk, eat, and talk without assistance. At that time, a control lumbar puncture was performed, with normal findings; CSF was without inflammation and without intrathecal synthesis; and anti-NMDAreceptor antibodies were negative. Control EEG was normal. After 93 days of hospitalization, she was dismissed in a good condition with residual memory deficit. We continued with follow-up treatment with intravenous immunoglobulins (1 gram monthly, a total of 4 times) and simultaneously we gradually decreased the doses of antiepileptic drugs (valproic acid). After eight months from the manifestation of anti-NMDAreceptor encephalitis, the patient was without medication, with a normal neurological and psychological profile, and she was able to return to school and normal life. 1) The g-subunit of PP2B, a candidate for the schizophreniagene, is known to promote NMDA receptor internalization. 2) Neuregulin-1 is associated with both schizophrenia and NMDA receptor hypofunction. 3) A small subset of patients with first-episode schizophrenia was found to have anti- NMDA-receptor antibodies. NMDA receptor dysfunction is also found in alcohol and cocaine dependence and Alzheimer’s dementia. In the present case, the initial psychiatric symptomatology and seizures were complicated by a malignant catatonic state with autonomic dysfunction and risk of death. The first-line immune therapy (corticosteroids intravenously, IVIG, and plasma exchange) was without effect, with further progression of the disorder to malignant catatonia. Second-line immune therapy (cyclophosphamide and rituximab simultaneously) stopped the progression of encephalitis and led to improvement. It is necessary to initiate second-line immune therapy as soon as possible in cases in which first-line immune therapy is without effect or when other progressions of the clinical presentation is noted. It is important to diagnose and treat anti-NMDAreceptor encephalitis because it is potentially reversible with appropriate treatment. Untreated, it can lead to cognitive deficit and death [10,11]. In severe and possibly life-threatening anti- NMDA-receptor encephalitis, it is essential that a quick and adapted treatment is implemented. Child neurologists and psychiatrists need to know that anti-NMDA-receptor encephalitis occurs frequently in children and adolescents. Plasma exchanges and immunosuppressive therapy treatments can dramatically improve the catatonic syndromes associated with autoimmune dysfunction, such as systemic lupus erythematosus, pediatric autoimmune disorders associated with streptococcal infection, and NMDA-receptor encephalitis . This case report pinpoints the importance of searching for a medical condition in catatonic syndromes of young people in order to treat them and avoid severe neurological sequelae or death . This project was supported by Masaryk University, Faculty of Medicine [grant number ROZV/24/ LF/2016]. Dalmau J, Tuzun E, Wu HY, et al.Paraneoplastic anti-N-methyl-D-aspartate receptor encephalitis associated with ovarian teratoma. Ann. Neurol61(1), 25-36 (2007). Dalmau J, Gleichman AJ, Hughes EG, et al.Anti-NMDA-receptor encephalitis: case series and analysis of the effect of antibodies. Lancet. Neurol7(12), 1091-1098 (2008). Rosenfeld MR, Titulaer MJ, Dalmau J. Paraneoplastic syndromes and autoimmune encephalitis. Neurol. Clin.Pract 2(3), 215-223 (2012). Consoli A, Ronen K, An-Gourfinkel I, et al.Malignant catatonia due to anti-NMDA-receptors encephalitis in a 17-year-old girl: case report. Child. Adolesc. Psychiatry. Ment. Health5(1), 15 (2011). Pathmanandavel K, Starling J, Dale RC, et al.Autoantibodies and the immune hypothesis in psychotic brain disease: Challenges and perspectives. Clin. Dev. Immunol2013:257184 (2013). Barry H, Byrne S, Barrett E, et al.Anti-N-methyl-D-aspartate receptorencephalitis: review of clinical presentation, diagnosis and treatment. BJ. Psych. Bull39(1), 19-23 (2015). Titulaer MJ, McCracken L, Gabilondo I, et al.Treatment and prognostic factors for long-term outcome in patients with anti-NMDA-receptor encephalitis: an observation cohort study. Lancet. Neurol12(1), 157-165 (2013). Mythri SV, Vivek M. Catatonic Syndrome in anti-NMDA receptor encephalitis. Ind. J. Psych. Med38(2), 152-154 (2016). Hardy K, Evans R. Multiple episodes of neuroleptic malignant syndrome and: overlap with malignant catatonia. Prog.Neuro psych20(1), 19-21(2016). Urani R, Vincent A, Schott JM. Autoimmune encephalitis: treatable syndrome with characteristic clinical features. BMJ 342(1), d1918 (2014). Anti-NMDA Foundation, Ontario, Canada: What is Anti-NMDA Receptor Encephalitis? (2013).